How to get to Denali National Park? There’s no finer way to arrive than aboard Alaska Railroad’s flagship train, the Denali Star. Passengers especially appreciate the panoramic views, as on a clear day the route offers incredible views of the train’s namesake peak: Denali, the tallest mountain in North America. We recommend that passengers made advance reservations for accommodations at the Park, as it is not possible to get to and from Denali from Anchorage by rail in the same day. 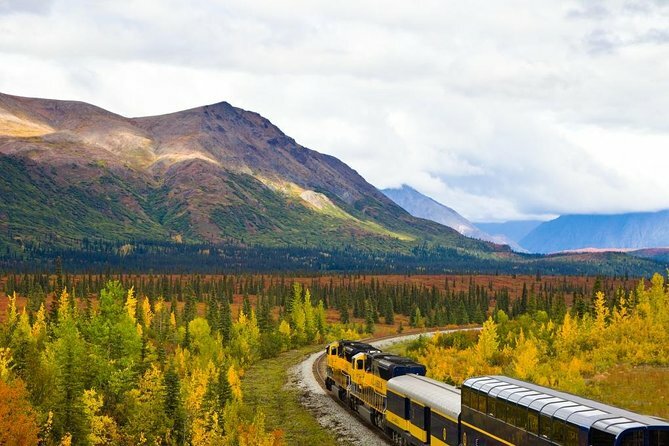 A return rail journey from Denali to Anchorage may be booked separately for a subsequent day. The route spans two of Alaska’s five geographic regions – Southcentral and Interior Alaska. On a clear day, passengers enjoy sights of the train’s namesake peak: Denali, the tallest mountain in North America. Traveling between Anchorage and Talkeetna, the train crosses the Knik River with the Chugach Mountains as a backdrop. Just south of Talkeetna, watch for views of Denali rising high above the Susitna River. North of Talkeetna, the tracks veer away from the road system and into the backcountry Hurricane area; this region offers views of the snaking Indian River, the occasional remote cabin and the expansive sight of Hurricane Gulch from the top of a 296-foot bridge. Just south of Denali National Park, Broad Pass offers majestic views of the Alaska Range in all directions; north of the park, the train winds along Healy Canyon, following the curves of the Nenana River below. Snack bar and optional dining available for purchase. Accommodations and return transportation to be booked separately and at own expense. May be booked independently or through Alaska Railroad directly. These options can be booked independently or through Alaska Railroad directly after booking. Infants (0-1) may be added to a reservation as lap children (not requiring a paid, reserved seat) but they must be registered in the booking. To register an infant as a lap child, please indicate so in the “Special Requests” option in the final checkout and include the infant’s name, age and gender.